It seems so very recently that we started down this road together. Who could have predicted that we’d come to this point? Not the characters in this show and certainly not the creators and writers. In truth, there’s not a lot of spoilers. It was a standard show. The inexperienced member of the team has his first solo mission, meets a girl and that girl turns out to be the would-be killer. This is very straightforward, very predictable, very dull. For one of the first four episodes on a show which is suffering in the ratings to be so blase about delivering even newish content and story, it shows that the makers of the show are already looking for their next gig. Unfortunately helming such a failure won’t impact their chance of finding that next gig. Such is the TV industry. Once again, there are numerous holding shots of the lead detective’s bosom, where they show as much cleavage as possible while maintaining their PG-esque rating. This is the core of the show; the surface. There’s no depth. The attempt at depth comes from the vision of the future. Anyone looking at the “vision” were you see three people in a vat would have tonnes upon tonnes of questions about what’s happening. There is no concrete answers and yet the characters aren’t bothering to look for those answers. You’d think people who spend their lives looking into the future would care how it plays out. The other major issue I had with the episode was how they are using Hawkeye; the system which is non-precrime precrime but it’s also the reason they are using to bring Dash into the police. The Hawkeye system is a computerised surveillance system which gives information to the cops about potential threats AND sometimes acts independently. Big Brother is watching. Supposedly, Dash is an analyst, who looks at the information provided and make some helpful determinations. Problem here is that they have no evidence provided by Hawkeye to point to the killer pointed to by Dash’s vision. At no point do they use or even reference Hawkeye. They do some independent computer searches, but those are done by the living, breathing personnel and not by Hawkeye. So, when the suspicious LT. goes to have a look at the records (or the FBI who are already suspicious about Vega’s first two shootings), they won’t find the evidence which lead Vega to the would-be killer. Also, did they really allow the killer to go free? Beyond the moral implications of this, not the mention the legal ones, what about the surveillance state they’ve got going on? The whole point of the Minority Report world is that it’s a high-end surveillance state. They really need to read their own source material, or take a few hours out to watch the movie... possibly for the first time. 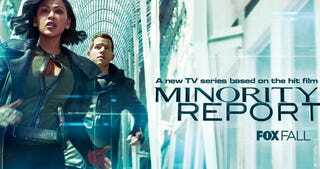 Fortunately, however, we have come to the end of our journey with Minority Report. It wasn’t fun while it lasted but fortunately, it’s a win in my prediction column. It’s good to look on the bright side.